Cool field study on carbohydrate loading that I missed when it came out in the International Journal of Sports Performance over the summer, but just noticed on Amby Burfoot’s Twitter feed. Researchers enrolled 257 runners preparing for the 2009 London Marathon in a five-week online study where they entered all sorts of details about their training and diet leading up to the race. The subjects had an average age of 39, and an average finishing time of 4:34. In addition, although individual differences in race day diet did not strongly influence the marathon performances of recreational athletes, the amount of carbohydrate ingested during the day before race-day was identified as a significant and independent predictor of running speed. 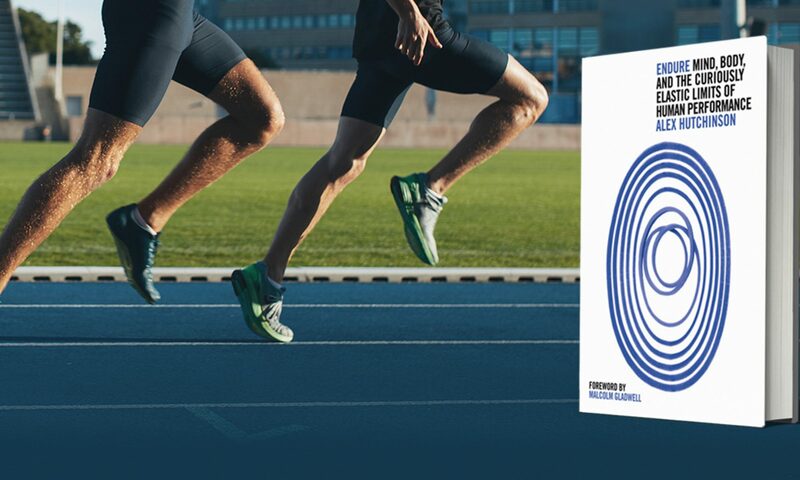 Furthermore, those runners who ingested more than 7 g carbohydrate per kg body mass during the day before the event ran faster in general and also maintained their running speed to a greater extent than those participants who consumed lower quantities of carbohydrate. The most obvious question here is: Is this correlation or causation? It’s certainly plausible — in fact, it’s probable — that the most serious runners who’ve trained best are also those who realize they should eat a lot of carbs. To address this, the researchers did a matched-pair analysis. There were 30 runners who consumed more than 7 g/kg of carbs. From the rest of the subjects, the researchers extracted another 30 runners pair-matched to the carb eaters so that there was no statistical difference in age, BMI, training data, and marathon experience between those two groups of 30. In the graph above, the open squares are the carb eaters, and the open circles are the matched group that ate fewer carbs. The finding remains the same: the runners who ate fewer carbs ran slower — and perhaps more importantly, their speed declined more sharply during the race, particularly between 35 and 40K. Non-randomized observational studies like this need to be treated with caution, needless to say. This isn’t “proof” that eating carbohydrates the day before the race makes you faster. 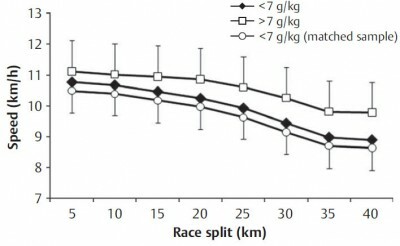 But it certainly fits with our current understanding of endurance physiology, and it offers a tangible target for midpack marathoners: 7 grams of carbohydrate per kilogram of bodyweight (a number that conveniently agrees with studies that have found that a single day at 10 g/kg is enough to fully max out your glycogen stores). Is it known how many grams of carbs per kg of body mass are needed when one does a workout the day before (just easy, but say, 30 minutes)? How bout if you do two 30 minute workouts? I was in a hurry when I posted that… What I meant to ask was how the workouts the day before a race affected one’s ability to load. Does it help? Hurt? Have no known affect? Obviously one needs to load with more calories if calories are used, but does working out allow one to load more? @Bman: My understanding is that some exercise the day before a race is indeed necessarily in order to maximize carb storage, at least in the one-day carb loading protocols (i.e. eat 10 g/kg of carb to fully load muscle glycogen stores). So an easy half-hour swim (or run or whatever) would be ideal. Previous PostPrevious Men’s marathon: how much faster is it getting, and why?